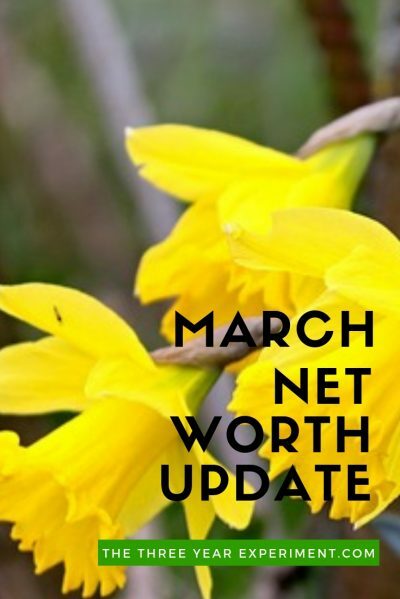 Our net worth now stands at 55.6% of where we started. 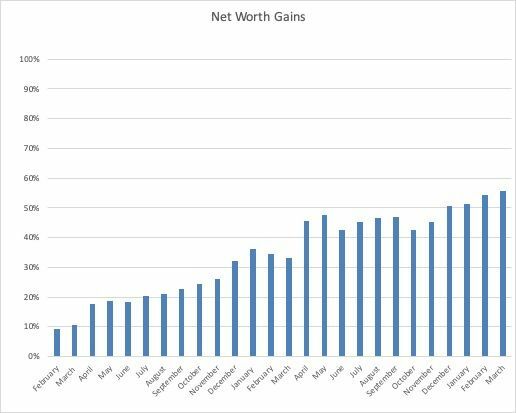 Our gains came primarily from the stock market and home equity. Sorry for such a boring update–I’m hoping next month is more exciting, when Mr. ThreeYear’s stock gift is announced. We are not-a-super-frugal family, so I hope our spending reports are helpful to look at/inspirational if you’re not either. We’re proof that you can reach your financial goals without being extremely frugal, although that certainly helps things along! We use YNAB to track our spending, and we budget a month ahead, meaning we use money from the previous month (February) to pay for our expenses in March. After our No Spend February, March expenses picked up quite a lot. We had one big expense, tickets for my sisters-in-law to come visit us for two weeks in July. Unfortunately, the only time they could get vacation was during the middle of the most expensive travel time from Chile to the US, and one ticket would have used up all of our points. Mr. ThreeYear’s oldest sister has never been to the US, and his other sister last came for our US wedding, fourteen years ago. So we basically said, come whenever you can! Charity: $87. Compassion International plus contributions to the local church we’ve been attending. Eating Out: $277.83. A full $185.34 of this total went to taking our neighbors out to eat at a really nice restaurant early in the month. Next time, they’ll pay. The only other substantial restaurant expense was brunch out as a family when my mom came to visit. Entertainment: $67.19. I had a baby shower for my sister and the boys and Mr. ThreeYear went to see a movie. We also rented a couple of movies on iTunes. Fun Money: $176.17. Mr. ThreeYear bought another desk for his office (it was a wooden desktop from Ikea and he got the legs online). He also bought a bunch of Tylenol to take with him on his trip to Chile (he combined it with a work trip and is visiting them for a week). I bought a parenting book, Google storage, and entrance to a museum for a field trip I chaperoned with Little ThreeYear. Gifts: $278.63. Most of this is for the shower I hosted for my sister, who’s having a baby next week! She and I took my mom out to lunch for her birthday as well. I co-hosted a shower for my sister at my house. We had over 25 women here. It was fun! Tickets: $3464.26: The cost of the two tickets from Santiago to Charlotte in July for my sisters-in-law. We used money we saved up last year from our grocery challenge for one ticket, and dipped into savings to buy the other. Maybe if you’re planning a trip to/from Chile, don’t plan it in July? Pro tip. Health Insurance: $447.68 This year, we switched to a high-deductible HSA account. In addition to our health and dental premiums, we also have $250 per paycheck taken out for our HSA fund. Fitness: $620. Our club messed up and overcharged for our fitness membership, so we’ll get a credit next month. This also includes $43 of group tennis lessons. Since we’ve moved to North Carolina, we’ve decided to prioritize fitness. Clothing: $94.64. I signed up for the women’s tennis league this Spring, but I didn’t realize we had to buy a “uniform” (overpriced tennis clothing) and lunches after all of the home matches. I think in the future I’ll do a less-expensive type of tennis, like the Compass matches Mr. ThreeYear plays, which are maybe $50 per season. Haircare: $72. Two haircuts for Mr. ThreeYear and one each for the boys. I still haven’t had my hair cut or colored since May of last year. Can I make it an entire year? Home Maintenance: $704.84. Okay, here we go. 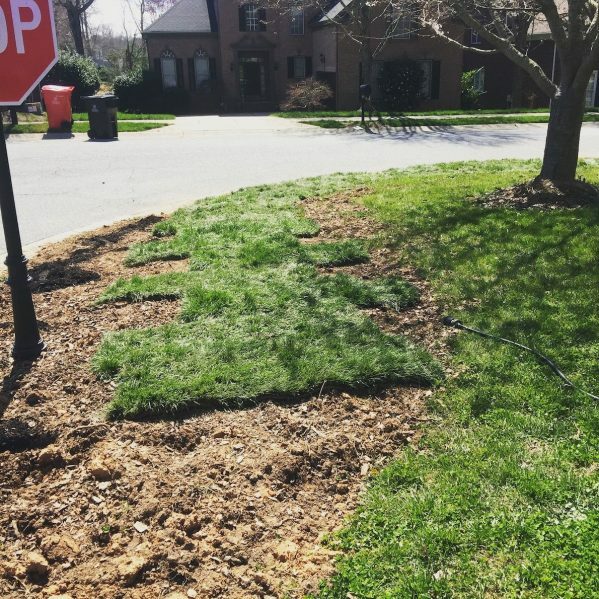 This month, Mr. ThreeYear and I embarked on an epic, DIY lawn adventure. Unfortunately, because I didn’t take pictures, I can’t show you the epic-ness of all the work we did. But we took out a HUGE row of bushes that blocked the road at the perimeter of our yard by HAND DIGGING them. I cannot tell you how hard it was! Then we opted for sod to cover the 500 square feet of red clay we then had to cover. Read all about my sod buying snafu here. 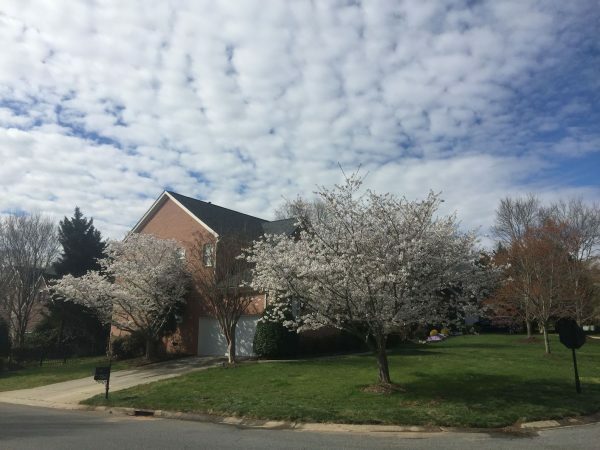 This giant home maintenance total includes sod, renting a tiller, buying a digital RainBird (irrigation) interface to water the grass, and a new plant and runner, which I admittedly bought for the baby shower to make the house look nice. Household Goods: $141.38. Legs for Mr. ThreeYear’s office desk (I don’t know why I categorized half here and half in his spending), Chilean liquor, an alarm clock for Junior ThreeYear, and razors. Babysitter: $74.84. We paid for the babysitter for four kids when we went out to eat with our neighbors. Yes, I have to find a cheaper babysitter. 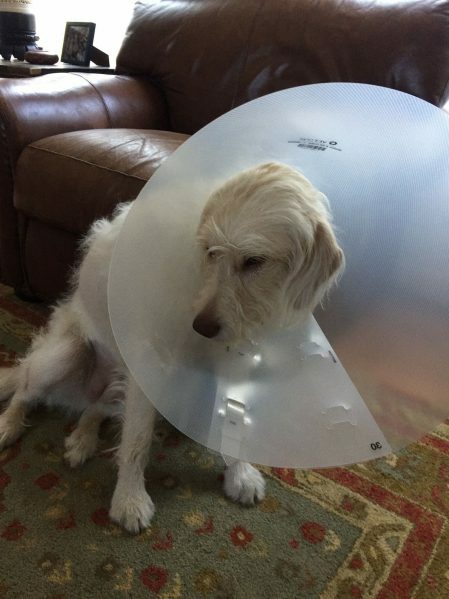 Pet: $105.40: Lucy got spayed this month! We did the surgery at the affordable “Stand for Animals” clinic and I already paid for it (as part of her “New Puppy Package” where I got all vaccinations and the spay for $150), but I did have several add-ons the day of the surgery: $5 for nail clipping, $25 for a microchip, $10 for a cone, and $15 for extra anesthesia because she’s so huge. Also one bag of dog food. Poor Lucy after her surgery. She adjusted to the cone really quickly, though, and now she’s cone free! Gas: $211.45 Whew! It’s higher when we actually drive. Mr. ThreeYear drove to the airport and back twice, and we drove to South Carolina (three and a half hours away) twice. Registration: $155.46. Apparently owed this on the new car, and it became due this month. Internet: $0. I’m happy to announce that Mr. ThreeYear’s work is going to cover this cost going forward. TOTAL: $8034.33, or $3501.02 without the tickets Without the tickets, this is a pretty low total. I'm actually surprised because I felt like we spent soo much money in March. Just goes to show why tracking the actual $$$ is so important! While our mortgage isn’t included in the total, even adding it in, our total spending without the plane tickets is pretty low (for us). Our new reality is that our fitness costs are high and fixed ($363 per month in dues), but that spending category is optional and we can cancel it anytime. For now, we’re getting value out of it and will continue to be members of our club. Otherwise, though, we’re continuing to learn how to keep utility costs low (with the exception of watering our grass! ), as well as gasoline, food, and entertainment. Who says you can’t teach an old dog new tricks? As I mentioned earlier, it snowed yesterday (very lightly), so I’m hoping that’s winter’s last hurrah before heading out of town. We’re expecting 70-plus degrees for the rest of the week, and since we’re heading to the beach for Spring Break in a week and a half, I’m hoping for much warmer weather very soon! Nice monthly progress Laurie. Although, I have to chuckle — That $704 you spent on your lawn this month probably totals more than I’ve spent in a decade of being a homeowner with a lawn. I have no doubt that I have vastly overspent you in every category! 🙂 You continue to be a major frugal inspiration, though, and I hope that in the future, I’ll spend more like $0 annually on my grass! I know–it is a truly ridiculous endeavor, spending so much money on something that is, aside from a social marker, completely worthless to our lives. And yet, I succumb to the peer pressure of it all. How long was the babysitter there? Because depending on the amount of time, $75 doesn’t seem unreasonable for 4 kids. I love all of the categories and explanations. Keep up the good work! We are doing pretty well with the month so far. Hubby bought starter mix and we have a dozen flats of vegetables, melons, and flowers on two folding tables near the sliding glass doors. We also planted parsley, kale, spinach, mint, dill and cilantro in the raised beds that we prepped just prior to planting. We consider the garden an investment as we have fruit trees, various berry bushes and strawberries. We picked over 125 quarts of blueberries last season. We made jams, used them for baking and froze them for later use. At $8 a quart in the store, I call that a win. I also sold jams and raw honey last fall as my side gig. Both sell out fast. We are getting about two dozen eggs a day from our chickens and we sell about ten a week. Chicken and duck manure is great fertilizer for our garden. Leaves from the lawn and driveway were vacuumed up and shredded last fall, before adding to the garden. We have clover and dandelions in our lawn, that is fine with us keeping it more environmentally friendly rather than a toxic wasteland that requires constant watering. We just mow the green stuff, that is it until the leaves fall. No toxic chemicals in the garden or in our lawn as we are keeping it organic for better yields and to not kill our bees. Last May our blueberry bushes were so covered in bees we could hear the buzzing sound. We get exercise in doing the chores and we access the gym on the nearby military base for FREE as hubby is retired military. Nice perk. We planted clover in the back field of our property ($125 invested) as ground cover and improved forage for our bees. Hubby gave both of my boys their haircuts yesterday. So much less hassle, cost and work for me. They let him know when they are due and he does them. Takes him about ten minutes each, and both my teen and younger son like his work, he doesn’t just buzz them, he uses the clippers with different attachments as well as the shears over comb to cut the longer hair on top and blend it with the sides. I personally like his work as they always look great, never any horrible haircuts like they got at the barbershop. I am due for my quarterly trim, so I plan to have him do my hair later this afternoon. I get caped, my waist length hair combed out and sectioned, pinned up and then he lets my hair down and trims each layer in increments. A polished, well groomed look as my ends are kept neatly trimmed. I save over a grand a year insourcing all of our haircuts. And my mother who does not make much money at her job, has hubby give her haircuts as she likes that he listens, gives a good haircut and it saves her the expense of the salon. My best friend stops by two to three times a year and takes a seat for a trim as she doesn’t trust the scissor happy stylists at the salon with her hair. She is very particular with her hair that is cery long like mine, she doesn’t like paying the high cost with the added long hair surcharge only to have them cut off way too much. So I help my mom and best friend save hundreds a year, sharing my stylist. I made venison jerky in the dehydrator for snacks and to take in my lunch for work. Venison is almost gone, hubby put two decent sized deer in the freezer last season. Ground meat, sausage, chops, stew meat and roasts were all part of tasty meals. I plan to fill one of the freezers with vegetables this fall as well well as canning and making pickles. We save through insourcing where we can and producing our own fruits and vegetables. This is such a view into the beauty of a frugal life. Your family obviously works hard to make your own food and keep chickens, but you reap so many rewards. And your husband sounds so capable with haircuts. I occasionally give my boys haircuts, usually in the summer, but I’m slowly getting better. Your life sounds pretty great. My parents grow blueberries and I know exactly what you mean with the bees. The bushes are alive with them in the Spring. Next Next post: Finally, A Plan to Save for Your Kids’ College. But Is It a Good One?